Welcome to the CLAYTON COUNTY GAGen Web Project Page. My name is Kemis Massey and I am the county coordinator for this site. In order for the site to be truly helpful to all it needs to contain a both history of the county and it's families. So, PLEASE share your family and county history with others. This site doesn't belong to me, it belongs to us. Help me make it the best site we can. If anyone has books on Clayton County and are willing to help others find their Clayton County Roots, please let me know. I'd like to set up a page with those willing to help. Like many of you I do not live in Clayton County and I know it's hard for me to do research there - I can't be alone. Type in GACLAYTO and select the year for your search. Would you like to share your materials? But aren't sure where to go. Visit Clayton County Archives to see what others shared. Let us know if you find a relative. Don't forget that you can also share things to archives. You could have a distant cousin is looking for you. How are they going to find you without your clues? Did you know that all of the GAGenWeb Project sites are maintained by volunteers? These sites are a labor of love. You can express your labor of love by submitting a birth record, obit, census info, or any other things that you may have your Clayton County Families. Clayton,Augustin Smith (1783-1839) Born in Fredericksburg, VA.,, November 27, 1783. Member of Georgia State House of Representatives, 1810; State Court Judge, 1819; member of Georgia State Senate, 1826; U.S. Representative from Georgia at-large, 1832-35. Died in Athens, Clarke County, GA. June 21, 1839. Interment at Oconee Hill Cemetery, Athens, GA. In 1990 the population was 182,052 by 2000 it had jumped to 236,517. 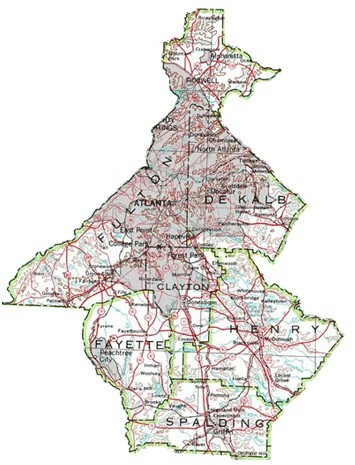 The Land Area of Clayton County is 143 square miles. 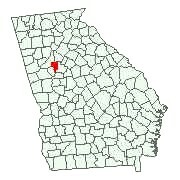 The County Seat is Jonesboro, GA.
Clayton County was formed from parts of Fayette and Henry Counties on November 30 1858. It was the 125th county created in Georgia and named for Augustine Smith Clayton (1783-1839) (See above). Before the official formation of Clayton, the area was home to the Creek Indians especially parts surrounding the Flint River. Leaksville was founded in 1823 and was later renamed to Jonesboro and was one of the critical stops on the railroad that ran from Macon to Terminus (Terminus was later named Atlanta) - this connected the southeast part of the state to the port of call in Savannah, GA. Jonesboro, was named for the popular engineer Colonel Samuel Goode Jones, who was in charge of that early railroad construction and resided in what was then called Leaksville. For the first time in history, Clayton had a link to the Pacific and the rail corridor permitted local farmers to ship their cotton in all directions. And it was this same rail corridor that brought the Battle of Atlanta to its climax during the Civil War. When Union soldiers severed the railroad line at Jonesboro, the Confederates lost their supply line and Atlanta fell into Yankee hands. Clayton County was the site of heavy fighting during the Civil War. After the battles of Rough and Ready and Jonesboro, the Confederate armies were forced to vacuate the area. General Sherman then began his "March to the Sea" in late 1864. Margaret Mitchell, author of "Gone With The Wind," placed Scarlett OHaras beloved Tara at a fictional location in Clayton County. Much of the action of her work is based on historical events which she found on record at the old Clayton County Courthouse in Jonesboro. Herb Bridges is the leading "authority" on GWTW and has the worlds largest collection of GWTW memorabilia. He has authored 5 books in re GWTW - the last one is entitled "The Three-Day Premiere in Atlanta". The railroad has played an important part in Clayton's history, it was the convenient railroad that made Clayton County an early commuter community in the 20th century with Atlanta businessmen leaving their country estates each morning and returning in the evening on the train affectionately referred to as "The Dummy" for some long-obscured reason. (See newsclip below). Clayton today has turned into a bubbling metropolis that has emerged as a natural setting for commerce, industry, business and people due to its location and the availability of resources and transportation services. Clayton is one of the faster growing counties in Georgia. Clayton County is also home of the Hartsfield International Airport in Atlanta. Don't forget to check out our neighbors. . .
GAGen Web Project State Coordinator and County Coordinator Clay, Miller, and Seminole Counties.